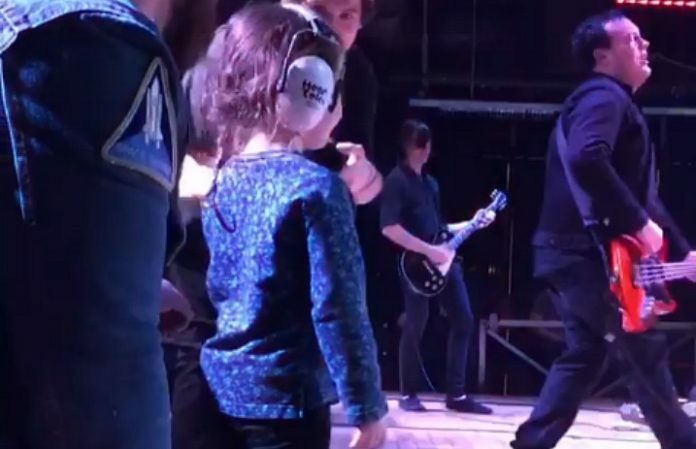 The Dangerous Summer had a very special guest during their show at Baltimore Soundstage, and it just might be the most precious thing you'll see all weekend. The Dangerous Summer frontman AJ Perdomo's daughter, Luna, joined the band during their performance in Baltimore Feb. 1, and the video of the tiny, well-behaved rock star is enough to make your heart swell. I mean, just look at her. Luna looks like she's meant to be on stage. Fans immediately fell in love with her, and couldn't believe how well-behaved the toddler stayed during the performance. Can we talk about how @ajperdomo has the most well behaved toddler I have ever seen? So docile on stage during a rock show! Check out footage of Luna enjoying her time on stage below. Luna is destined to be a rockstar. We have to agree. Luna is definitely destined to be a rock star. Catch the Dangerous Summer at their remaining North American tour dates below. Will you be seeing the Dangerous Summer on tour? Let us know in the comments below!